One of the biggest improvements I’ve seen since moving to Fusion , is I’m better able to effectively manage open RO’s. Maximizing income and increasing agility are two common best practices when it comes to running any business. Having a business management system in place that allows you to see what’s going on in real time and is built with heavy-duty best practices will set you up for success. The combination of real-time data and best practices built into Karmak Fusion, gives Lande the ability to make quicker, more informed decisions for his business. “I like being able to access everything on my phone. I have my dashboard and my reports, and can go to my iPhone and look them up anytime,” says Lande. manage open RO’s now that everyone in the company is able to see them,” Lande said. Best practices for closing open RO’s each month can be implemented with the visibility Fusion brings. Real-time data has also helped him to be more agile in his business by identifying obsolete parts. This dead inventory can be very costly, as it represents idle capital. Having exposure to parts inventory can eliminate unused parts and free up cash to use in other areas of the business. or had been transferred to another branch over 12 months.” This lack of visibility made it difficult to quantify the true level of obsolete parts. “With Fusion, I have a report that I can pull in real time and it tells me exactly the quantity and dollar value of all our parts that haven’t sold in 12 months,” he said. Because of that, he continues, “We are able to quantify it and eliminate unused parts.” And now, Lande has tied a portion of the management incentive compensation to reducing part obsolescence. 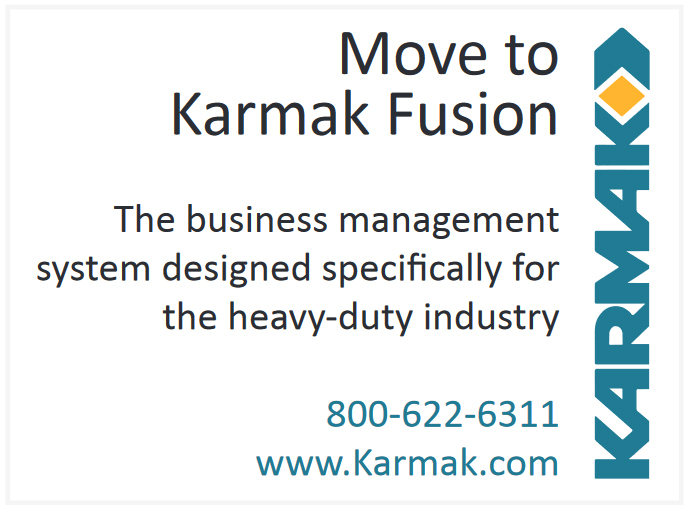 Karmak Fusion will maximize profits and increase agility using real-time data and builtin industry best practices. Staying informed and having visibility to daily activity in real time will allow you to make quicker, more informed decisions for your business.